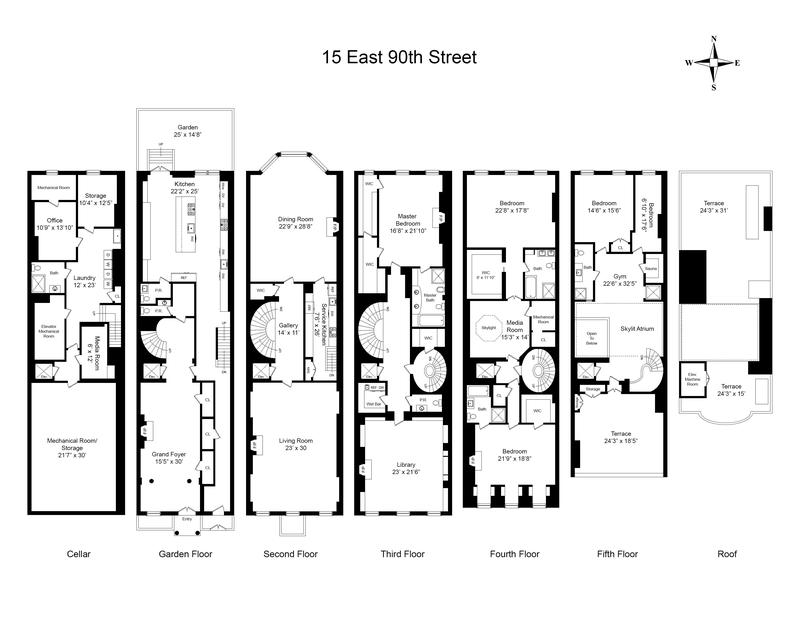 15 East 90th Street, New York, NY 10128 | Sotheby's International Realty, Inc.
$18,950,000 5 Bedrooms5 Full / 3 Partial Baths12,173 sq. ft.
Renovated, Park Block, 25 feet wide Carnegie Hill Mansion at attractive new price, boasts approximately 10,000+ square feet of living space plus a renovated lower level and a gorgeous, south-facing rooftop terrace. All floors accessible by large and swift elevator. Constructed in 1928, and completely renovated in 2010, this steel and concrete townhouse sits mid-block on East 90th Street with direct access to Central Park’s Reservoir through the historic Engineers Gate. Surrounded by numerous schools and the conveniences of upper Madison Avenue’s charming restaurants and boutiques. The width, volume and location make this a rare opportunity to become this home’s fourth owner. One enters into a traditional marble floored reception room with fireplace and onward toward an elegant, elliptical staircase, powder room and paneled elevator. A separate discreet service entrance allows direct passage from the sidewalk to the immense SieMatic chef’s kitchen. This area provides access to the garden terrace, renovated lower level and service staircase to the huge butler's kitchen, adjacent to Formal Dining room above. The enormous Parlor floor landing has a 14 x 11 foot gallery with soaring 12 ½ foot ceilings. A grandly scaled south-facing living room with fireplace overlooks the Church of Heavenly Rest, while a stunning dining room with fireplace and a bay window occupies the north side, serviced by the aforementioned 26-foot butler’s kitchen with enormous original silver safe. On the Third floor is the Master Bedroom with fireplace, renovated and spacious closets and bath. Glowing, wood paneled library with fireplace, wet bar and half bath complete this owner's haven. The upper staircase first lands on the 4th floor into a sky-lit media room, flanked by two full-width bedrooms with ensuite baths. Ascending to the sun blasted 5th floor, there is grand atrium containing a gym, two additional bedrooms, full bath, stand-alone steam shower and large sauna. Elevator access allows for effortless entertaining on the adjacent 450 square foot terrace. Curbed New York, "Manhattan’s 10 Largest Homes for Sale"